Hey there! Are you falling over from my sudden outburst of blog posts! 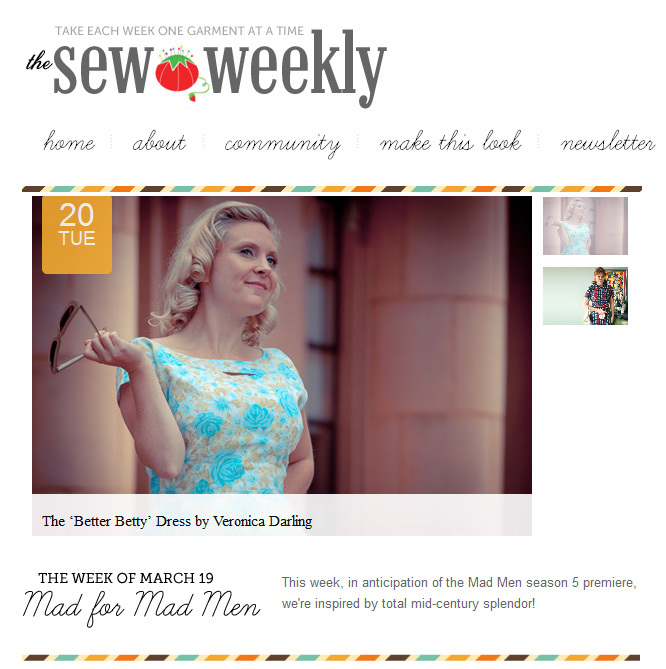 It's the only way I can keep myself back here, posting every day... so it's a little visit today, to show you my Sew Weekly post this week! The theme this week is the tv show Mad Men, which will return the US tellies this weekend (I believe) and it was a theme we'd always wanted to do last year, but the show had a year off! I was totally inspired and got into my pattern a little more... it took 6 hours of sewing all up, which is eons for me, as I like to cut corners! Here's my post, and you'll see more photos here in my blog later in the week! Mena also did a delightful plaid dedication to Peggy, so you must have a look at her enviable plaid matching! Oh my goodness....you are just the most adorable Betty Draper ever!!! I love love love your dress. It is stunning! Glad to see you back sewing. Your creations are always so inspiring.